First, thanks again for all the comments on previous entries. I filed a bunch of bugs this morning and updated those entries to list the bugs. 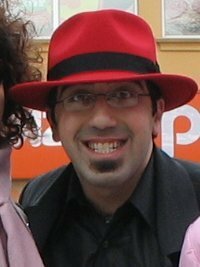 The bugs typically contain more informative less ranty comments, as this blog is a space to reflect my frustration and bugzilla is not. The "Close Window" bug in particular is much more clear than the post. I have two options at that point: 1) double-click on each message to read them in a separate window, 2) restart Evo. The tip from yesterday comes handy at this time. I also see a milder version of the problem when on certain other HTML mail, it takes a few seconds before Evo updates to show any other message. I call it the "pray period" as I'm typically praying that it gives up after a few secs and I don't have to restart the thing. First it was with pre tags, now with everything. Time to reconsider moving blog. Mathrick, my Summer of Code student, and I spent last night implementing support for multiple directions in a single layout. I left for sleep but he finished it, which in fact finishes his SoC project too. Read on his blog. Update 2: Previous entry about vertical Pango. 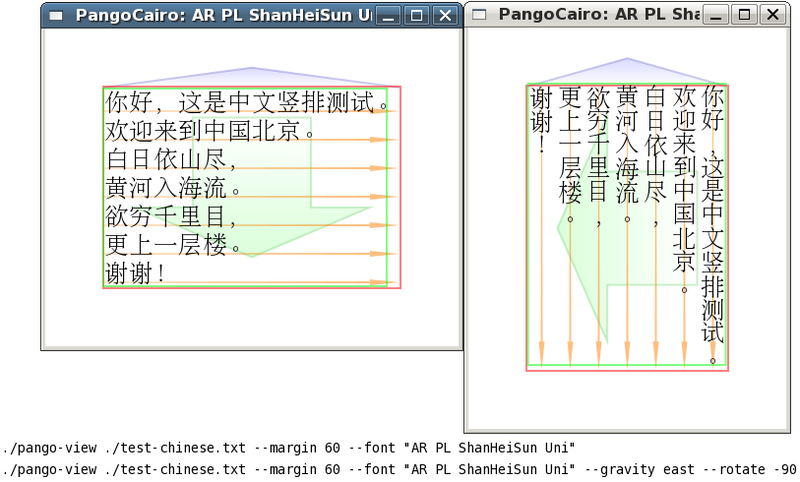 All the code is in Pango HEAD and cairo master. All the details have got to wait until tomorrow. Took 36 hours of work. Better really sleep. After spending almost the entire week working with Carl Worth during GUADEC to get cairo 1.2.0 out, a bunch of very nasty bugs were discovered. So, after a few weeks of work, we actually spent most of the past 48 hours getting the bugfix release out. Everyone, make sure you upgrade to cairo 1.2.2. Over 150 commits in 6 weeks for a bugfix release is only possible with Git. Go Get It. In other news, a boring Pango 1.14.0 was released too. Compared to 1.12, most notable change is update to Unicode 5.0 character database. There were quite a bunch of almost-ready patches in bugzilla adding new API, but a (-n almost) sudden request from the release-team to release Pango 1.14.0 well before the GNOME release forced me into closing this cycle without much new API. 1.15 should branch pretty soon and get a lot of new API, committed more casually as time will catch all the errors :-). I intentionally make Pango 1.14.0 require Cairo 1.2.2 as 1.2.0 is really broken for various reasons, specially for printing and for vertical font stuff (mathrick spent quite a few weeks trying to get his stuff work where it turned out to be a bug in cairo 1.2.0.) Now I can go back to hacking Firefox+Pango. More about that to follow. As if Segway was not enough, last week I observed an iBot in Dundas square, passing the street, including passing over the streetcar rails, on its two wheels. Impressive technology. Fun read, specially the "Baited by Shiver" tattoo exchange that I read over a bowl of pop-corn. Gtk+ bug you don't see everyday. DNS problems are resolved now. RiRa is back online.